I was gifted the Messy Me Messy Mat in exchange for a product review. All thoughts and opinions are 100% my own. 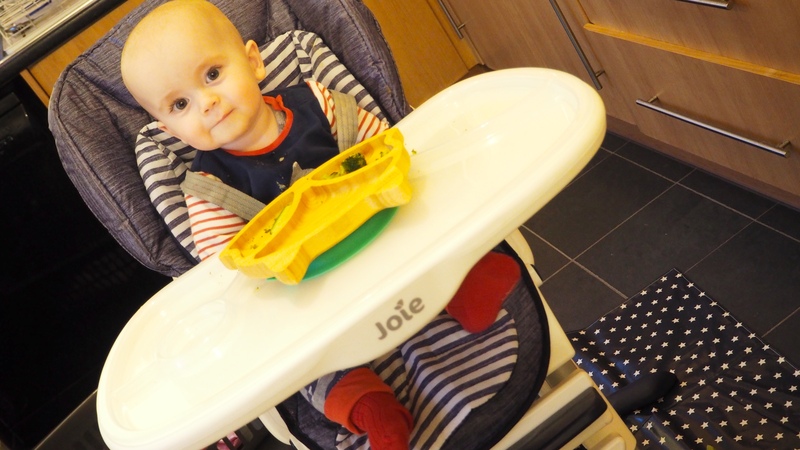 We are currently going through the exciting stage of weaning. When I say exciting I really mean messy!! Who knew babies trying food would make so much mess with more food ending up on the floor than in their mouths! It’s been even harder as Noah doesn’t seem to tolerate solid food very well. He will gag and then projectile vomit everywhere. And I mean everywhere! It has been quite bad as it usually requires a full change of clothes and practically taking the highchair to bits to get it cleaned properly. The Health Visitor is thinking that he may need to be referred to the Speech and Language Development but he does seem to be vomiting less so hopefully that is a good sign. Anyway back to weaning and the mess that they make……. 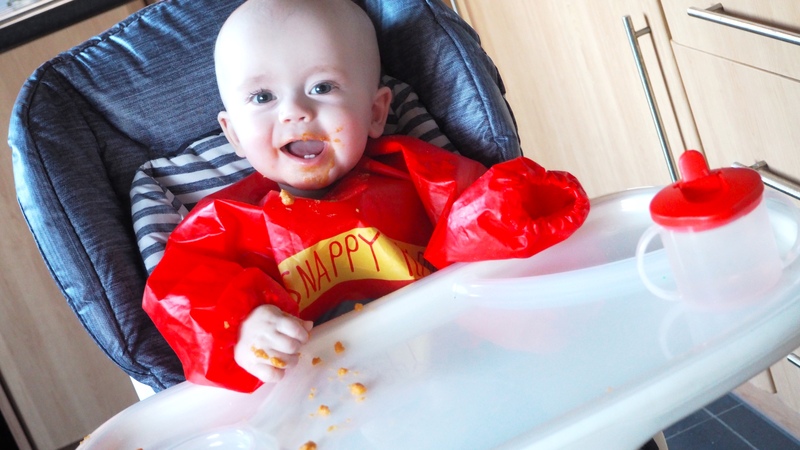 As well as the usual weaning bits that you need such as a highchair, spoons, bibs, plate/bowl (top tip: get one with a suction base, or you will be cleaning mushy food off your walls for the next few years) a splash mat is really worth getting. 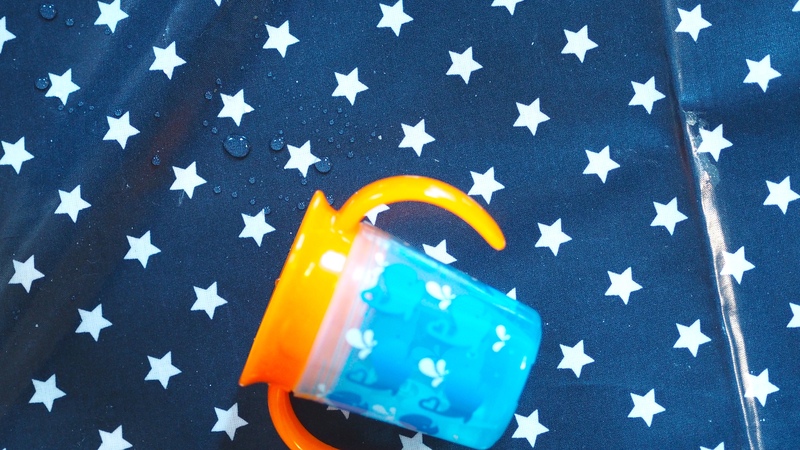 If you are not sure what a splash mat is it’s a waterproof piece of fabric that goes under your baby’s highchair and will catch any mess that your baby will fling around manically accidentally drop on the floor. The Messy Me Messy Mat is exactly one of these mats and is a godsend; no more scrubbing the floors to remove crusty purée and yogurt! Oh no! You just give the mat a wipe with a damp cloth and voilà the mess has gone! Also cleaning the aforementioned vomit has been made much, much easier too as no mop and bucket is needed. 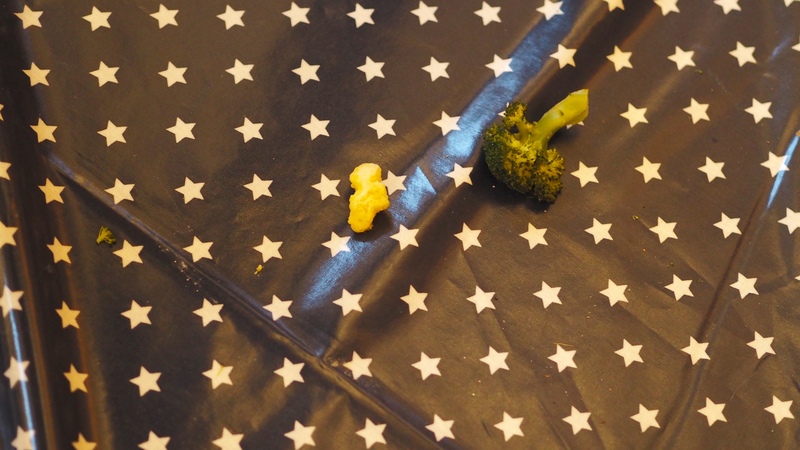 The Messy Mat (£24) is made from oilcloth and comes in a few different designs. I chose the Navy Stars design which has white stars on a navy background and is very pretty. Measuring at 90 x 120cms it is large enough to protect your floor from food flingage but small enough that it can be easily folded and stored away in a drawer or packed in a bag if you are travelling somewhere. With self-feeding comes the inevitable…….. Which someone finds very amusing! Protecting your table/floor when they are using paint, Play-Doh, glitter, glue, etc. Under a sensory bin to catch any bits of rice, pasta, etc that works it’s way out of the box. The oilcloth material used is BPA, phthalate free and is certified to meet Oeko-Tex Standard 100. This means that the cloth does not contain chemicals and components harmful to health which is very good to hear. The Messy Mat can be placed in the washing machine on a 30°C cycle but is for occasional machine washing only. If you do end up washing it then be aware that it cannot be tumble dried. In my opinion I think that the Messy Me pMessy Mat is something really worth having. 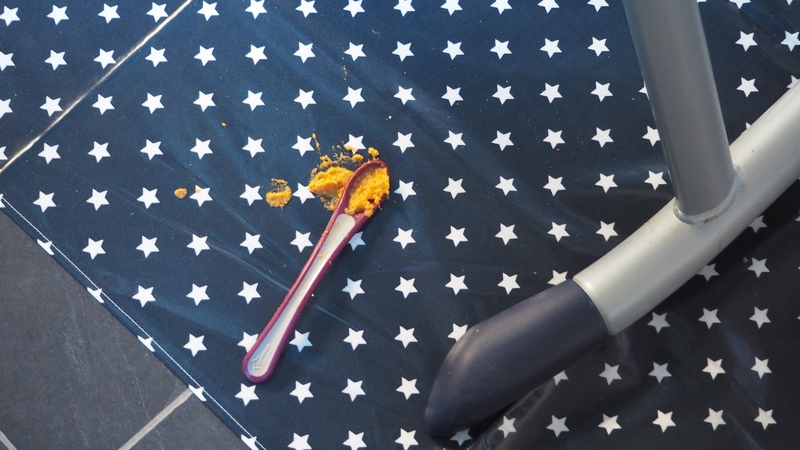 It saves so much time tidying up once they have eaten as no need to take the vacuum out to hoover up the crumbs, just shake the mat into your bin and give it a wipe with a damp cloth. Also any spillages on the mat will just disappear with a quick wipe. It folds up well so I just chuck it into my changing bag when we are visiting the grandparents. No-one wants rice cakes, fruit, veg, etc trampled into their carpet/rug. As I mentioned earlier the mat can have other uses too so it is definitely money well spent buying one of these mats. Messy Me have other products such as highchair cushions, highchair inserts, highchair covers as well as tunics, bibs, aprons and even cute clutch bags with mini changing mats. You can check out their range of products here. Do you use a splash mat? 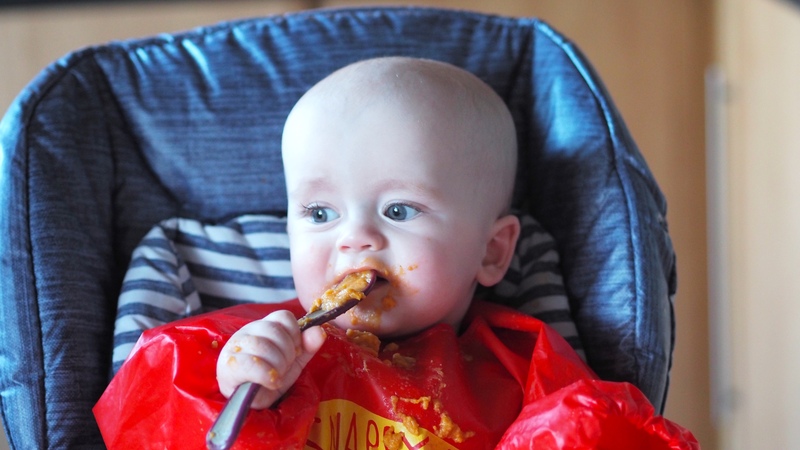 What’s your most useful weaning item? Let me know in the comments below. "55 Advent Calendar Activity Ideas"